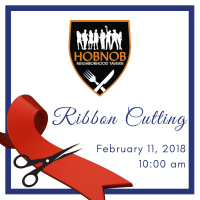 The Dunwoody Perimeter Chamber will host a ribbon cutting to welcome HOBNOB Perimeter to the Dunwoody community at 10 a.m. on Monday, February 11, 2019. The celebration will be held at their new location at 1221 Ashford Crossing, Atlanta, GA, 30346. Joining in October 2018, HOBNOB Perimeter has already become active within the Chamber by hosting a First Monday Networking event in January 2019. The Chamber is delighted to celebrate another addition to the Chamber family. “The Chamber is thrilled to finally and formally welcome HOBNOB Perimeter to the Dunwoody community. Their presence here adds value to the Perimeter Market, providing another great dining option for those who live, work, and play in Dunwoody,” Stephanie Freeman, Chamber President & CEO said. Following the ribbon cutting, attendees are welcome to enjoy a range of light appetizers and beverages. Attendees will also have the opportunity to win HOBNOB swag. The event is free to attend and open to the public. Although registration is not required, it is strongly encouraged so that attendees may enjoy HOBNOB’s accommodations to the fullest.